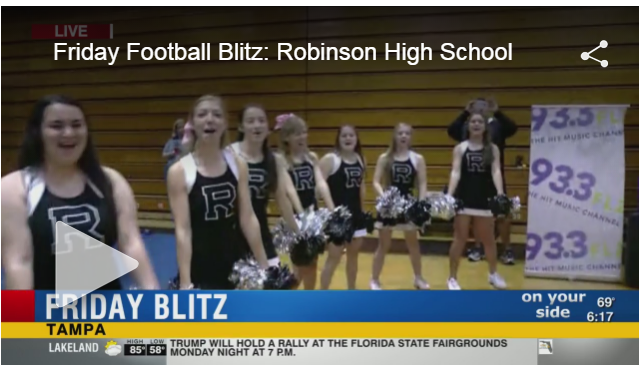 Proving again that cardboard boxes provide hours of fun, journalism students at Robinson High School in Tampa, Florida, clamor to wear a yearbook box costume created to market the yearbook. And the costume reached a wider audience Friday when a WFLA reporter interviewed a student wearing it during an early morning homecoming pep rally. The six members of Robinson’s yearbook marketing team made the yearbook costume to feature in a marketing video that won first place from the Florida Scholastic Press Association in the Yearbook Commercial and Posters category. From there, the costume, made of a cardboard box with construction paper and paint, has had a life of its own. “Honestly, everyone likes to get into the box. Sometimes they just walk around and tell people to buy the yearbook,” Joanie Oben, who advises yearbook, newspaper and television journalism, said. “Basically, it’s hard to get people out of the box, so it’s not in pristine condition anymore,” she added. Oben said her yearbook students have been at work marketing the book and sales are ahead of last year by about 25-30 books. Currently they are running a marketing campaign on Snapchat, showing everyone at school wearing their spirit wear during homecoming week. Artists on staff have made hand-drawn fliers that are created using Illustrator. They also plan on using Walsworth’s “You’re in the Yearbook” cards soon. Oben said Macy McClintock, a sophomore on the online newspaper staff, was the first to ask permission to wear the box, saying she wanted to attract attention and be on television. McClintock is very comfortable in it, Oben said, as seen on the video.